As the mum of a toddler girl, I’m REALLY fed up with pink. I have nothing against it as a colour (in fact, I rather like it), but on the rare occasion I get to buy new clothes for small one, walking into a shop and just finding rack upon rack of one colour is seriously off-putting. So I am doing something about it. I’ve been working very hard on a new venture, Pretty But Not Pink – gorgeous girls clothes in every colour but pink, pulling together the best unpink fashion from lots of high street retailers in one place, to add some variety to girls’ wardrobes. 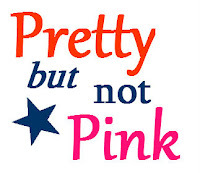 If you’re looking for non-pink dresses, tops, or any other “unpink” fashion for girls aged 0-14, please take a look, join Pretty But Not Pink on Twitter @PrettyNot Pink or like us on Facebook and let me know what you think!